Nice presentation of our cutleries. 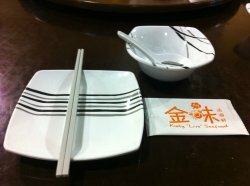 We ordered this vegetable dish which was a special type of vegetable and couldn't be found elsewhere at other zi char stores. 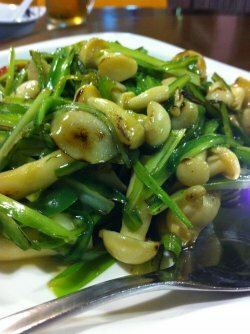 I think it is a cross between spring onions and perhaps, spinach as it was crunchy and had the spring onion taste but it also had this spinach taste, thus my funny description. It's really unique but the sauce was a little too salty for my liking. However, I found myself reaching for more. It's still quite enticing nontheless. 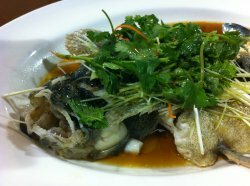 We also ordered the soon hock fish. My family never really like eating the whole fish as we were lazy and didn't want to deal with bones. But this time, it was different as the fish was really fresh! I could still taste the ocean while I was eating! HAHA! It may be a freshwater fish though, I'm not too sure. Overall, this is a good place to have a mini gathering with your family and friends!